When shooting snakes photos it is important to remember that they are very fragile creatures. 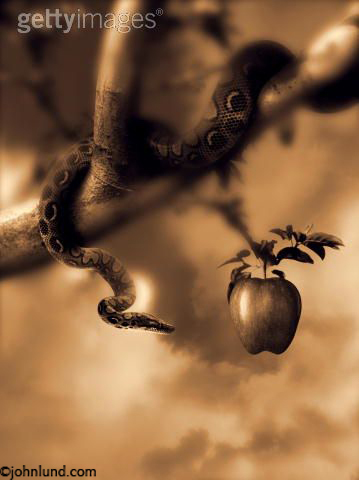 Picture of a snake and an apple in a tree. The cobra swayed ever so slightly as he twisted his head from side to side eyeing us cautiously. Camera glued to my eye, I edged a bit closer, snapping off frames, playing with the composition. 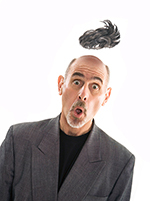 The snake struck the side of my face before I even knew what was happening. I fell backward, away from the blow, my heart pounding. Even though I knew that the de-fanged snake was harmless, adrenaline was coursing through my veins! I was in Mumbai, India, photographing a cobra in a boardroom. Wherever I go I try and come up with concept stock images, and the parts I will need to create more such images when I return to my studio in Sausalito, California. Of course, as usual, things were more complicated than I expected. Finding a cobra to photograph, for example, wasn’t such an easy thing to accomplish. Turns out they don’t allow snake charmers to entertain the tourists in Mumbai anymore. My Indian producer did finally manage to find one at the last minute. As we were already shooting in a call center, we had the snake charmer set up in one of the meeting rooms. My plan was to shoot the snake in such a way that I could later shoot a businessman and have him “charming” the cobra out of his briefcase. OK, corny idea, I admit it. And I never did do that image. But the cobra images did come in handy. 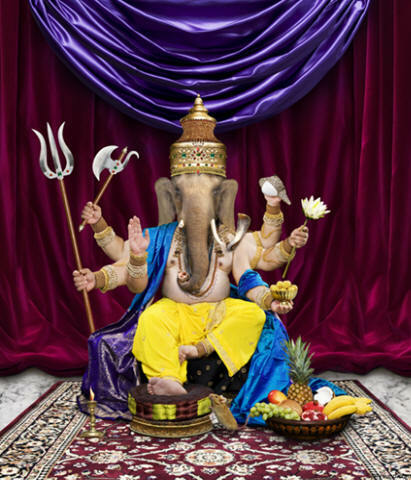 I utilized the Cobra photograph in a stock image I created of the Hindu god Ganesha, the remover of all obstacles. Ganesha, as it turns out, wears a snake as part of his pantheon of symbols. And you never know where that Cobra may show up next! During the shoot it was obvious to me that the snake charmer, a poor Indian man, but possessed of grace and dignity, was fond of his Cobra. Every time I have photographed a snake I have done so under the supervision of its owner. I shoot a lot of animals and we always use either the owner or a professional trainer to guide us in how to shoot the animal without stressing or endangering it…or us! When shooting snakes it is important to remember that they are far more fragile than one might guess. They have thin, delicate bones, are very sensitive to temperature, and are easily stressed. If the snakes in question are poisonous then I would never get within striking range, and certainly wouldn’t even attempt to photograph one without a professional handler. No snake picture is worth dying for!